Greetings, friends! The Mailbag had a flurry of activity this week, and the frenzied demand for Heroes and Villains is palpable. For the rest of this month, each card featured in the Monday “Card of the Week” series will will be a new preview. Furthermore, image galleries (ten cards each) will be uploaded to the blog every Wednesday and Saturday until launch weekend. 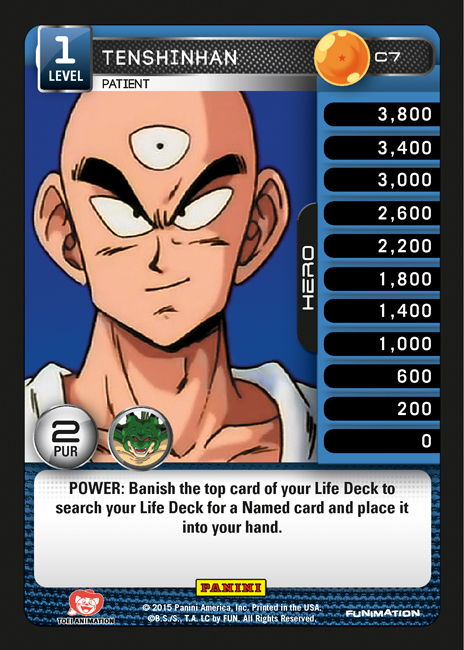 To get things rolling, the end of this article includes a special “Card of the Week” spotlight on Tenshinhan. First off, be sure to check the Store Locator tab to see if there is anything in your area. If you visit stores that carry the game but do not run tournaments, have them e-mail dbz@paniniamerica.net for prize support. Building a local scene can take time, but I hope your efforts lead to something rewarding! Moving forward, there will most likely never be that long of a gap between releases. I think a reasonable schedule is three sets per year, but other factors can always change that. Minor alterations to a card (such as a voice actor’s signature or a small drawing) are permitted, but the final legality of a card will always be at the discretion of the judge. Any kind of alteration that obscures the card text or makes the art unrecognizable would not be allowed. Physical modifications are not legal, nor is any kind of card that was not an officially released DBZ card (i.e., printed out art glued onto a card backing). Thanks to everyone who wrote in, but I think everyone is ready for some spoilers! Remember, you can have your questions or comments answered here by sending an email with “MAILBAG” in the title to dbz@paniniamerica.net. As always, use the same address for any rules questions. And now, Tenshinhan! 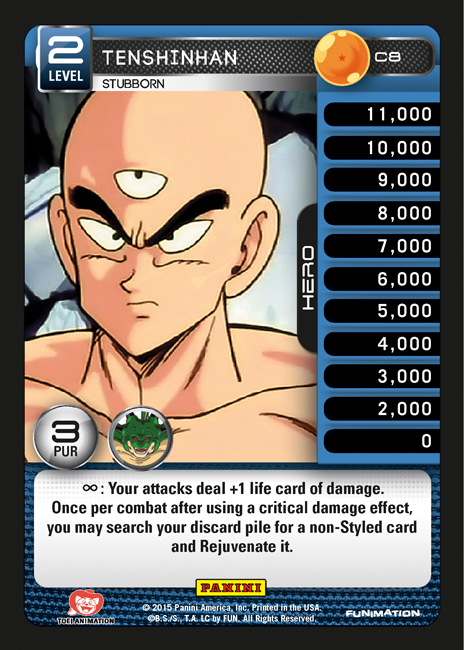 Tenshinhan – Patient nets you a card. That’s good. However, you might banish key cards from your Life Deck with repeated uses of his Power. That’s bad. You get to search for the card that is added to your hand. That’s good. The cards that he is able to search for also serve to diminish your Life Deck. (That’s bad). His Level 2 will make your attacks more likely to deal Critical Damage, allowing to Rejuvenate something tasty (more on that in a moment). 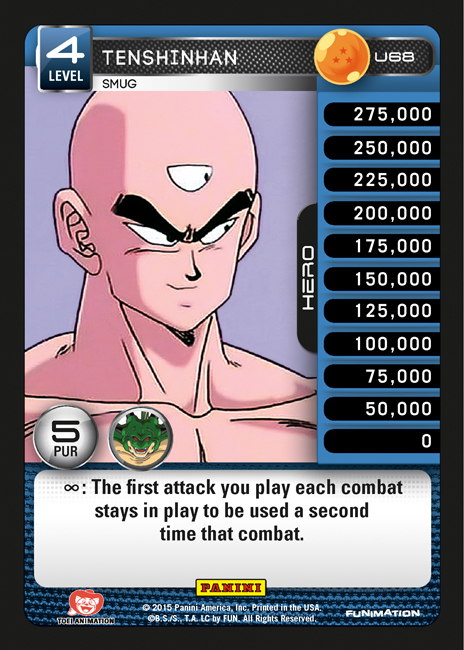 Tenshinhan – Prepared forces you to make a choice on Level 3. 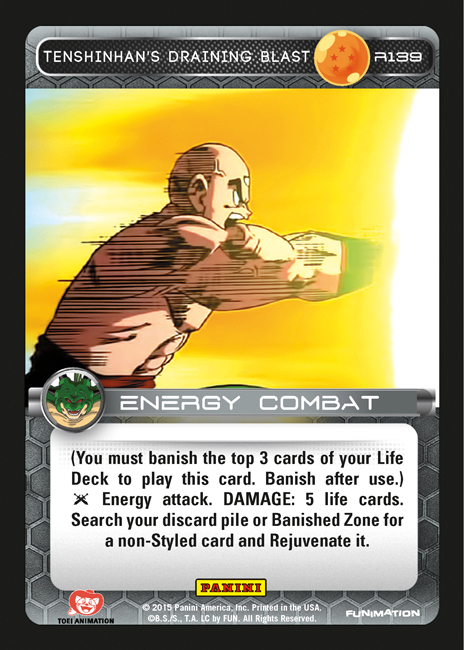 You can finish your opponent off with a final damage push, or continue angering up to threaten an MPPV victory. Once you hit Level 4, you can end the game very quickly with any kind of attack that raises your anger two levels. Tenshinhan’s Preparation is one of the more aggressive effects in the game. 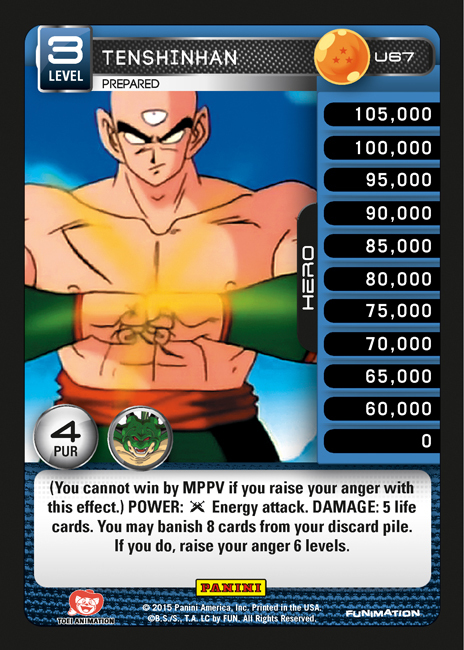 When evaluating this card in relation to his MP, it’s clear that Tenshinhan can really push the pace. Though the deck destruction is symmetrical, it is more likely to favor the aggressor. At the same time, Tenshinhan’s Preparation creates a huge tempo swing with a net +/- of four anger levels. Finally, it replaces itself after use (and any other time it is Rejuvenated), allowing you to keep up the pressure. Meanwhile, Tenshinhan’s Draining Blast makes sure your engine continues to fire on all cylinders. Of course, it comes at a high cost – use it wisely! Which Styles look like they will work well with Tenshinhan? Tenshinhan’s screaming to be played with Orange. I was really hoping for Tenshinhan out of the gate and he is more than I hoped for. Red will love this guy. He has awesome synergy with level chaining, critical effects, and anger management. All of which are Red’s bread and butter. I’d lower my MP to Draw Cards on purpose with him. 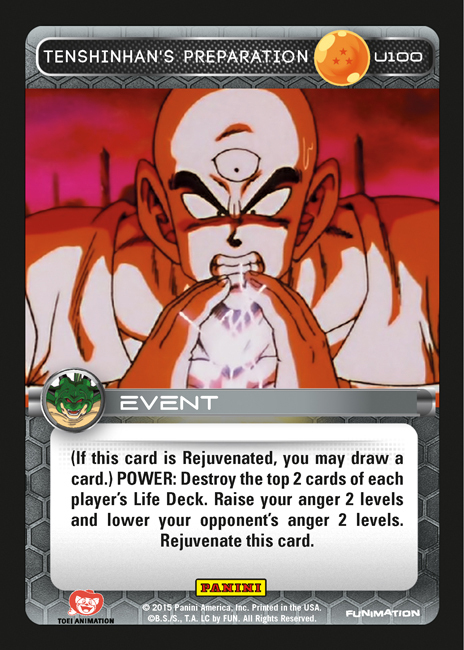 black or blue dragon ball deck using that rare to rejuvenate dragon radar seems legit. It’s obvious Red’s gonna love this guy. Too bad he can’t play namekian. He’d shine in that style. Black seems like it would be an excellent style for Tenshinhan. You are dealing +1 life card with the mastery, on his stage 2 you will be dealing +2 cards with every attack. That will push many attacks into the critical range on their own. Also you are going to be whittling their life deck down with both the mastery and the MP. Furthermore with the named cards, you can give your self some major card advantage. Battle Preparation + Black Command = an insanely threatening anger deck that goes crazy with anger once the life deck has been bled out.